I have another cute card from the November Make and Take to share with you today. Hopefully you still have some of this paper and the stamp set if you would like to re-create this fun yet simple card. Whisper White card stock 3-1/4" x 5-1/2"
Season of Style DSP 1-1/2" x 5-1/2"
Cherry Cobbler card stock 1/2" x 5-1/2"
For this sweet and simple Christmas card start out by folding the Crumb Cake card stock on the score line. Then stamp the snowflake image from Endless Wishes all over the top and bottom of the card front in Soft Suede ink. Now take the Whisper White card stock and stamp the "merry" in the upper left hand corner in Gumball Green ink. Stamp the "christmas" just below the merry in Cherry Cobbler ink. 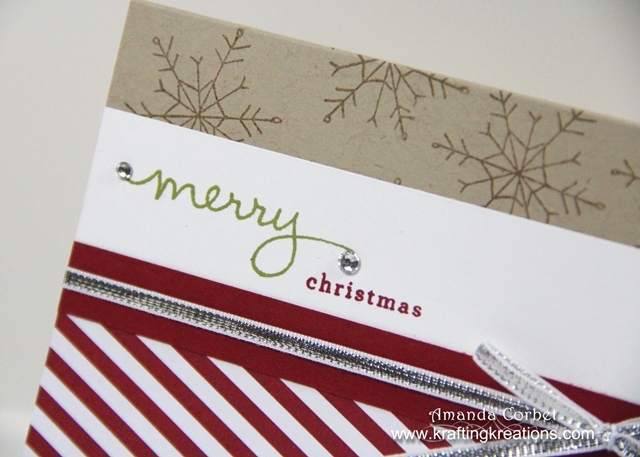 Use the Scallop Trim border punch along the bottom edge of the Whisper White card stock then glue this piece onto the card front. Glue the DSP onto the Whisper White card stock just above the scalloped edge. Then glue the strip of Cherry Cobbler card stock over the edge of the DSP. 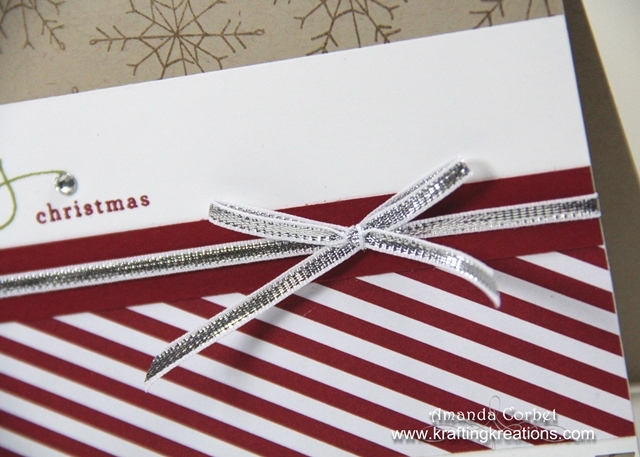 Wrap the Silver 1/8" Ribbon around the card front and tie it into a knot. Then, just to add a little more sparkle and shine, add a Rhinestone onto each end of the "merry". Ta daa! Fast and easy Christmas card done!